The best choice for your custom curtains, upholstery, and interior design projects such as slipcovers, custom cushions, pillows, and headboards. With a showroom, we also offer thousands of fabrics and solutions. Chairs are such a personal issue. How bad is the condition of the chair? Is the vinyl getting old? No worries. There is a professional out there in New Orleans that can handle anything. 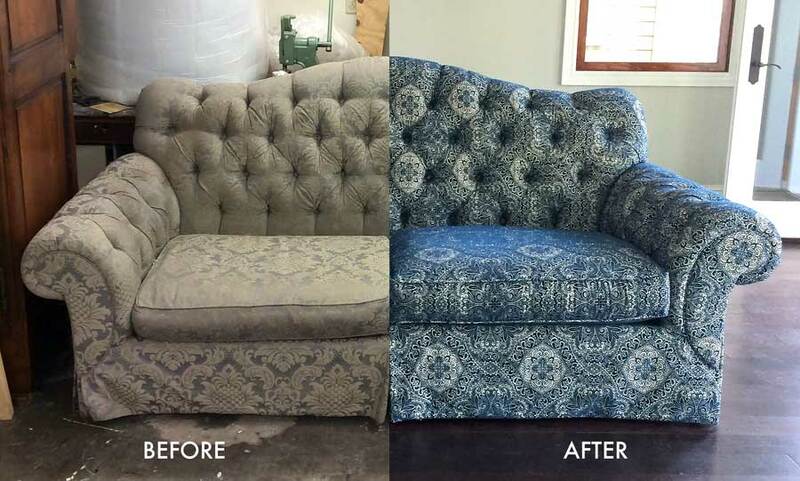 If it’s a recliner chair you are really attached to, you might want to entrust it to the hands of a good furniture restorer, such as Luz custom curtains & upholstery who specializes in turning salvaged furniture into masterpieces. Committed to all the details, from removing old covering. removing the staples, removing the fabric, replacing the stuffing, fixing broken dowels, taking care of all the tucks, pleats, folds – this is a restoration service that is all about professional reupholstering, and bringing your beloved old chair back to life! Check out the following video and see for yourself how they can revamp a chair in no time! One of the biggest furniture investments you’ll make is a chair. How about dressing up your old one and make it feel at home?. Give your chair a dose of style by a reupholstered look. With a selection of thousands of designer fabrics you can completely change the look and make it into a whole new piece that you’ll be able to use for many years to come. Check out the following video makeover of a retro chair that needed a fresh start. The only thing the owners weren’t happy about was the old upholstery. The new version features a beautiful fabric upholstery with a floral print. Now it’s a happy-looking chair. Many people use seat cushions outdoors to help brighten up their lawn household furniture, patios, decks, and virtually any other outdoor places where they spend their time frequently. Not just do they supply you with a little bit of style but they also help you to make your home furniture comfortable. Think about, you should get the ideal of both worlds. A single important factor in keeping your outdoor seat cushions looking great is usually to retain them clean and away from the rain and other extreme weather circumstances. They will very conveniently stain and trap scents. If this actual occurs, generally there is very easy way to completely clean your outdoor cushions. To get rid of stains and dirt, you can simply use of a scrubbing brush and a mixture of clean up liquid with water. While you are rinsing the cushions, you should continue to scrub these people with the clean drinking water. Dry the cushions away with a dry hand towel or cloth. It certainly is not a bad idea to allow the cushions dry in the sun. This can help to air away any odors that contain recently been trapped inside. This is going to usually take with regards to a working day if you had to soak them completely. In the event you still notice stench, you can spray all of them with a little textile freshener, or sprinkle these people with a powder structured freshener then vacuum. Following this process is completed, your seat cushions should certainly seem to be like new. Most of the people clean their cushions during the spring and autumn seasons to keep them looking nice and clean. If you are new and going first time to change your outdoor seat cushions, you can get ideas by checking our showroom at Luz Custom Curtains & Upholstery. We allow you to get customized style and size of cushions and pillow covers for your outdoor and indoor furniture. Customized covers and cushions can easily fit into your various types of patios. If you want to give a new fresh look to your indoor furniture like sofas, dining room chairs, stools, pin-cushions, pillows, benches and any other stuff in between then It is good idea to change the covers of whole furniture. Use high quality covers for covering your indoor furniture. If your furniture is unique in size and you are unable to find ready-made sizes of cushions in your favorite style then still don’t worry because many companies now offers custom indoor cushions and covers that completely fulfill your needs. These custom made cushions are durable because of their high quality fabric. In the design point of view, those cushions are outstanding and will get a new look to decorate your bedrooms, living room and even kitchen. There are many styles and designs available to choose from like modern or vintage style indoor cushions and pillow covers. Pillows are used to make our stay more comfortable in our home. You can use pillows indoor as well as outdoor. In pillows, comfort in the highest priority but with the comfort their cover also give you an amazing decorative look. Outdoor pillows mostly used in the patio furniture and on garden benches which are vary in their sizes and styles but custom outdoor cushions are completely suitable for every type of patios, benches and chairs. sunbrella outdoor pillows are very famous because they are reliable, durable, available in various colors and sunlight or other outdoor weather changes does not affect them. Indoor cushions are made for sit on the living room to chit chat with friends, guests and family members. Every comfortable chair and sofa has cushion seat and another cushion to hold your back. So in one hand indoor cushions give you comfort and on the other hand you can utilize them to decorate your bedroom or living room. Bedroom also has pillows and your pillows design, color and theme should match with your bed-sheet and curtains. So you can buy custom made indoor pillows and their custom covers that match with your overall bedroom decorative theme. I hope you get my point. First of all it is very rare when your cushions get dirty because they avoid external mud and dirt where possible but after using them long time you need to clean them properly. You will find that it's dirty and requires a wash so you can wash them to use again. It is the proof enough. Hence, the largest and the most evident good thing about covers is that it can help you keep up the pillows neat and tidy with no difficulty. Secondly, it offers added cushion for your head. The pillow cover is constructed of cloth and it just helps you feel convenient when you rest your head on the pillow. However, if you're moving in for pillow addresses, you can choose distinct fabrics which range from silk or natural cotton to even jute in the event that you happen to just like the same. Thus giving you the capability to customize the pillow to fit your personal requirements regardless if it is incredibly wacky and unconventional. Recovering old furniture is an art. It is better to recover old furniture than replacing it with new furniture. It can save you a lot of money. However, you must know how to recover your old furniture in the proper way. You can recover a pair of armchairs or sofa that is languishing in your store room with the help of a fun, vibrant, cotton print. New Orleans is your perfect destination for recovering old furniture. Luz Custom Curtains & Upholstery, located in New Orleans specializes in upholstery and Reupholstery. You can easily upgrade your sofas and chairs by using appropriate fabrics, cushion or pillows. If you have armchairs or sofa in your house that is old and antique, then consider recovering them rather than replacing them with contemporary furniture. The old armchairs generally take place in the store room as they don’t blend with the contemporary interior décor of the room. Many people have a couple of armchairs in their store room that are in good condition and are quite comfortable. The only defect that these chairs have is that they don’t match the new home décor of the room. However, the good news is that the armchairs that look totally out of fashion can be recovered. A transitional décor style that bridges traditional and contemporary is needed to bring back the arm chairs to use. Therefore, a tricky décor style is needed which will allow you to use the chairs. The armchairs generally have overtly traditional arm lines and ancient European-style fabric which looks passé. Keeping them in a modern room would look very odd. Therefore, you need to change the look of your old furniture with a little brainstorming and creativity. If the quality and material of the furniture are good and durable, then it is sheer foolery to replace them. You can put a great, contemporary fabric on a traditional armchair or sofa to give it a brand new look. You can further add vibrant cushions or pillows to enhance the look of your recovered old furniture. It is not wise to throw away a high quality sofa for a sofa that looks cool, but is not even made of real wood. If style is your primary concern, then you should artistically recover your old furniture. Furniture made of hardwood such as ash, oak or maple should not be thrown or replaced as they are durable. Change the fabric and add cushions or pillows to recover your old furniture. Located in New Orleans-Metairie area is the best choice for your custom curtains, window treatments, upholstery or reupholster, and home decoration projects. With the best showroom in town, we offer thousands of fabrics and solutions for your home or business, the film industry, and the hospitality industry. Luz Custom Curtains & Upholstery was founded in 2004. Right before hurricane Katrina make her statement in New Orleans in 2005. Luz’s workshop has a team of talented artisan and seamstress that supports the perfection required by our clients. Our business infrastructure has 6.000 square feet with eight heavy industrial machines, three big working tables. Luz is always striving for perfection and special attention to the user of her work, her client. Luz herself consider each project like a new-born child. She is on hand to oversee and work on each project being made by her and a skilled team of seamstresses and upholstery team. She has established an excellent reputation for making beautiful hand made custom curtains. Luz said "I enjoy working with my clients, they are my priority. I was so happy when a costumer from the movie industry in New Orleans said to me: “We have never found in New Orleans, including California, somebody like you that works so good, so fast, and perfect”. Well, she has been working with a thread an a needle since she was 8 years old. Experience is something that comes with practice over time and Luz has that. AT LUZ CUSTOM CURTAINS WE ARE COMMITTED TO EXCELLENCE. WHERE OTHERS SEE PROBLEMS, WE SEE CREATIVE AND UNIQUE SOLUTIONS. AS ARTISANS AND CRAFTSMEN WE MAKE OUR TASK TO TURN YOUR IDEAS AND VISIONS INTO REALITY. Luz Custom Curtains & Upholstery Blog is a space for home decoration ideas. With one of the best custom draperies & upholstery workshops in the greater New Orleans area, we bring the hottest home and hospitality industry trends and inspirations. We cover everything from antique upholstered furniture, slipcovers, headboards, bedding, cushions, pillows, Draperies, shades, cornices, valances, swags, cornices, and designer fabrics. We are here to share our knowledge. 701 Papworth Ave, Suite 104.